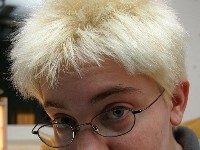 All dyes are applied to bleached hair and left on for a minimum of four hours. I try to avoid shampooing more often than every few days, use a gentle shampoo, and when available, I try to use a Manic Panic colorizing shampoo of the appropriate color in lieu of regular shampoo. I find that any dye needs to be reapplied at least every two weeks to maintain a respectable hue. There are a few, noted in their posts, which can be extended beyond that because they fade attractively. Applying 1 cup of equal parts vinegar and water after rinsing the dye out does not appear to extend the lifetime of dyes of either brand that I use, but it does rinse out extra dye that isn’t in your hair but doesn’t want to come off in the initial water rinse, thereby making your first shower less likely to leave blue streaks down your forehead and back. The cheapest place to buy Manic Panic online seems to be Vamp Fangs. This entry was posted in Hair Color by Karen. Bookmark the permalink.